This is not for the faint of heart because it's difficult to manage Ruby dependencies (i.e. deal with bundler) in LaunchBar actions. You will need to run bundle install --standalone for this to work. If you don't know what that is, you should probably stop here. If there is demand, I can probably create a dependency-free version of this that you can install with one click (tell me on Twitter if you want this). In any case, once you get this action set up, you can activate it in LaunchBar, type some text, hit enter, and it will post it to iDoneThis. After it's posted, hitting enter again in LaunchBar will open up the "done" you just posted in your web browser, or you can hit escape to hide LaunchBar. 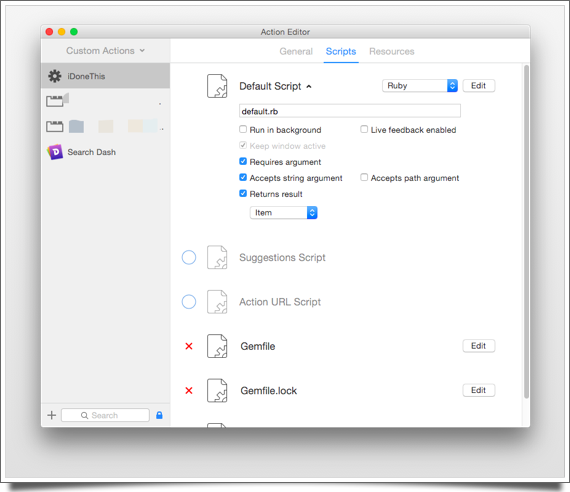 Below is the code and the settings you need in the LaunchBar Action editor. Again, this can't be packaged up as something you can install directly because you need to install the gems in the Gemfile and set the interpreter in the hashbang correctly for your system. If you can do all this easily, it should only take you a few minutes to set up.